Russell Road and jockey Jose Montano unleash a late charge to win the 2014 West Virginia Breeders' Classic. One of only two multi-millionaires bred in West Virginia, fan-favorite Russell Road passed away last weekend after a bout with colic. According to drf.com, the 12-year-old gelding had been re-training as a lead pony following his retirement in late 2016. Sired by Wheaton, Russell Road retired with a record of 31 wins from 62 starts and total earnings of $2,001,586. He ran in the West Virginia Breeders' Classic for seven consecutive years, winning it three times and twice finishing second. 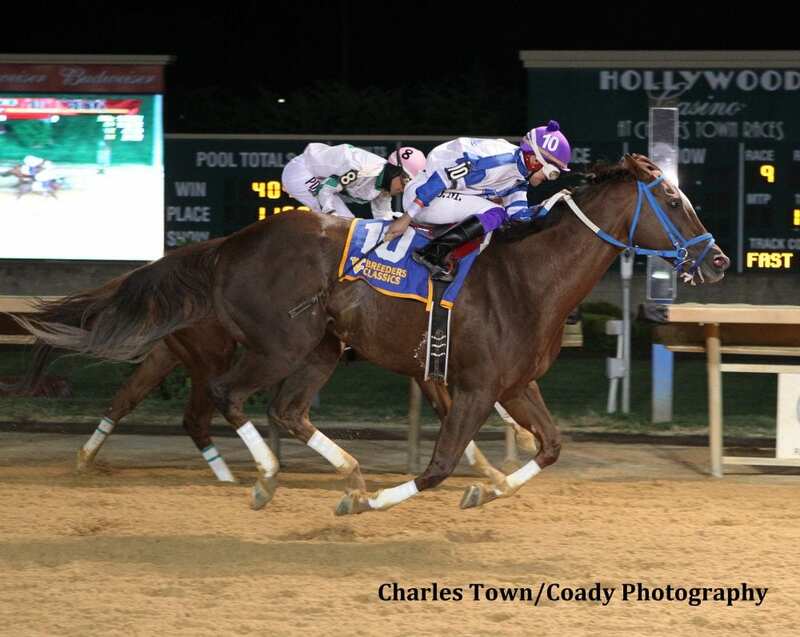 This entry was posted in NL List, Racing and tagged Charles Town, horse retired, james casey, retired, russell road, West Virginia, west virginia breeders' classic, wheaton by Paulick Report Staff. Bookmark the permalink.